After a week one opening night win in Washington that was enjoyable to watch from just about every aspect, now the REAL first test of 2016 is upon the Steelers, as they play their biggest rival in the way of winning the AFC North, that being the Cincinnati Bengals. Both teams have spoken about keeping their emotions under control after three games in 2016 that frankly were more like heavyweight boxing matches than football games. The Steelers seem to play better against the Bengals on the road, but are hoping to change that trend Sunday at Heinz Field. 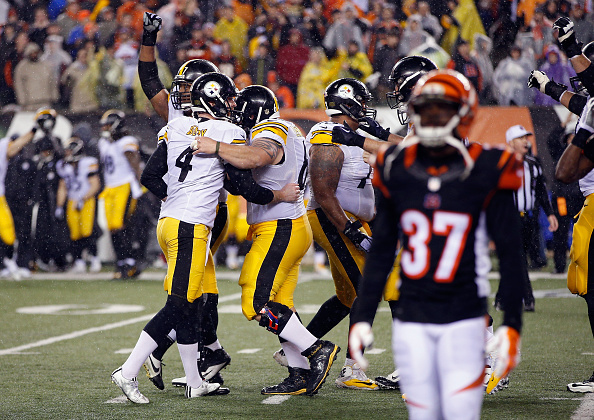 Since 2009 the Steelers are just 4-3 against the Bengals at home, with a 16-10 loss last season which put the Bengals at 7-0 for the first time in franchise history. Now we break down the big keys for the black and gold Sunday, to see if they can get to 2-0, and land a quick early season blow to their biggest rivals in the division. When the Steelers beat the Bengals, they almost always get the edge in the takeaway department, where it’s almost always the opposite when they don’t win. Remember last season the awful pick that Ben Roethlisberger threw with 2:57 to play when the Steelers were looking to comeback after giving up the lead? That has happened too often in this series, and it comes down to Ben being careful with the football and not making mistakes. He did a solid job of that Monday in the win over the Redskins, and has to do it again versus the Bengals. If there’s a game plan against the Bengals the Steelers should watch it’s that of the Bengals close win over the Jets last week. New York got to Dalton for six sacks, and usually if you can pressure Dalton, mistakes will follow. The Steelers didn’t get pressure on Kirk Cousins last week, but the secondary did enough to stop the Redskins from making big plays. This week hitting and sacking Dalton will be a focus, and there’s a good chance they will win if they can keep the Bengals thrower looking over his shoulder. While the Steelers don’t want to put Ben Roethlisberger in positions to have to force plays, one way to do that is do what they have done well against the Bengals – run the football. Against the Bengals last season the Steelers ran the ball well, and in the playoff win it was one of the biggest keys to why the team built a lead. The Bengals gave up 152 yards (5.1 per carry) in their win against the Jets last week, and if DeAngelo Williams can rush for 147 like he did Monday, that gives the Steelers a great shot at a win. Be the first to comment on "Steelers Gab 2016 Week 2 NFL Preview – Cincinnati at Pittsburgh"